We are developing a novel embedded-ensemble encoding (EEE) theory for mammalian neocortex to unify data from cell and network experiments, and to infer general principles of how information is processed in the brain. 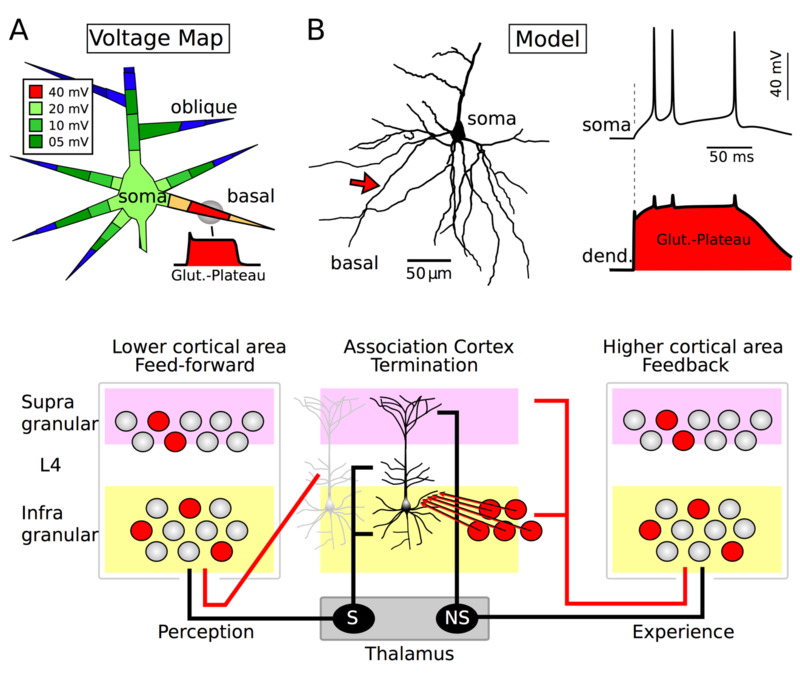 EEE theory is based on the observation that cortical pyramidal neurons produce synaptically-induced dendritic plateau potentials that place an individual neuron into an activated state. This brings that neuron near to threshold, and also reduces membrane time constant, so that the activated cell PNact can readily and rapidly follow synaptic inputs. We hypothesize that ensembles of these activated cells provide the activated ensemble Eact , embedded in the overall cells of the column. There is then a second embedding of an ensemble based on synchronized spiking among the cells of Eact . This twice-embedded ensemble is denoted as Esync , with Esync ⊂ Eact . Synchronized spike coding within area then provides the substrate for a broad distributed ensemble across areas that would allow the binding of multimodal features into coherent object perception based on binding-by-synchrony theory. In neuroscience, unlike in physics, detailed predictions for measures in the brain must be obtained by instantiating theory in simulation, which allows the experimentalist to correlate with the scales and measures that are experimentally accessible. Therefore, we will evaluate EEE theory through development of two innovative neurotechnologies: 1. detailed neuronal network multiscale models based on 2. simultaneous voltage-sensitive dye imaging, ion-sensitive dye imaging and whole-cell patch recordings of neurons. EEE theory may help reconcile rate-coding theory with binding-by-synchrony theory. It also has implications for Bayesian predictive coding theory – the outer ensemble could serve as a predictor for codings in the nested ensemble.